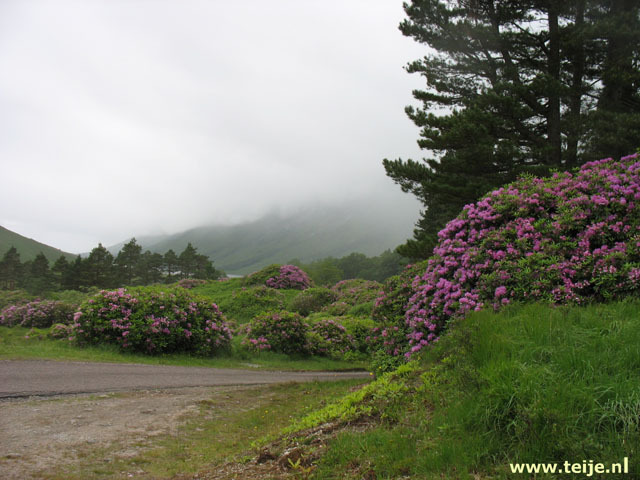 Between Spean Bridge and Fort William we drive along the Nevis mountains, with the Ben Nevis as the highest point of Great Britain, and the mountain peaks are all surrounded by clouds. A little further, in Fort William we have our first stop: in the past I always bought a few t-shirts with nice texts here, but unfortunately that shop does not exist anymore. But there is a terrace where we drink coffee and we find some nice souvenirs for our children and grandchildren. Then we drive further along the banks of the elongated loch Linnhe to the south until we reach Oban, a busy harbor town. Along the sea are all stately mansions and on the boulevard many people walk around, especially travelers who take one of the many ferries that depart from Oban to the Hebrides and other islands. There are many destinations and they are all islands. We go to the nearest, Mull, but you can also go to Barra, one of the outer Hebrides, a boat trip of almost 5 hours. We have some time left and, after a walk through the village, we gape at the unloading of the ferries. The front opens widely as a set of jaws when a boat approaches the harbor and once docked the cars seem to drive out through the open beak. By a quarter to 4 we can finally get on to the boat and we first sit on the outside deck to view the area. It is not very cold and there is little wind. Although we are at sea, there are islands everywhere, such as the almost uninhabited island of Kerrera just before Oban. And not much later we sail before the coast of Mull where we see the castle Duart from a distance, one of the places where we will definitely visit next week. We have never been to Mull before, so everything is new to us. 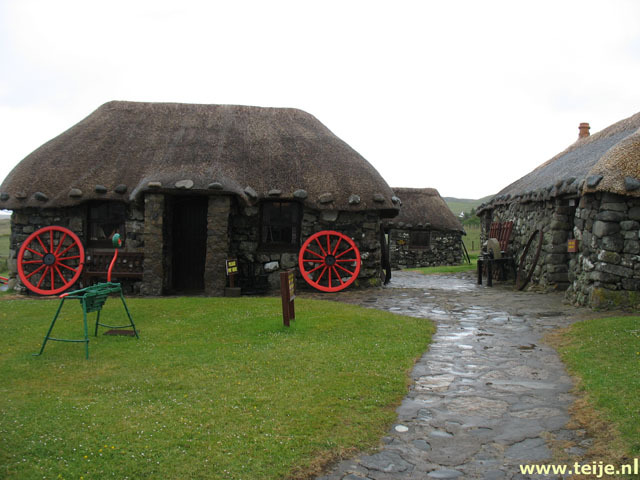 At a quarter to 5, exactly in time, we moor in Craignure on Mull and drive into the interior. There is a thick layer of clouds just above the island and we have already heard that the weather reports are not very good for the coming days. Hopefully not the same will happen as a few years ago on Arran when we had rain almost all week and we could not even leave the island. But we can not do much about the weather but accept it. We occasionally stop for a photo, but we take to side rodas on our way to the cottage that we rented at Salachran, all the way to the southwest of the island which, after Skye, is the largest inner Hebride island. Along loch Scridain we follow the road towards Bunessan and fortunately we have good directions to the house because it is quite remote and there are no signs. Along the narrow side road are a few houses and when we see a bright red telephone box, we know we are in the right place. A gravel path leads to the house that is 100 meters inland. And it is big! We knew that it is for 6 people but even for us this is a very large place! Around the house is a large lawn and the grounds have been fenced off to keep the sheep off the site. There are bunnies around and we have a wide view in all directions. First we explore the house inside and choose a bedroom that we like best. We have all the choice, there are 3 bedrooms, two sitting rooms, a large open kitchen and, what we like the most, a conservatory from which you can look in three directions. The conservatory will be our favorite spot the coming week when we are at home. Whether the sun is shining or whether it rains, this is the nicest spot in the house where we make ourselves easy every night. Fortunately, it is heated because it is necessary when it gets dark and it gets considerably colder. Later in the evening it starts to rain heavily and even then we sit snugly in the conservatory while the raindrops clatter on the roof. We just miss a fireplace but there is one in a living room. We still prefer to stay here. In google maps I make again a map of the itinerary that we took today, we should have done that on all travel days, then you still have a better idea of where we have been. It is made with the help of the photos so if we have taken a detour somewhere without taking pictures, it is not on it.